Jealous whispers. Old rivalries. New betrayals. Farther uptown, Henry and Penelope Schoonmaker are the city's most celebrated couple. But despite the glittering diamond ring on Penelope's finger, the newlyweds share little more than scorn for each other. And while the newspapers call Penelope's social-climbing best friend, Carolina Broad, an heiress, her fortune—and her fame—are anything but secure, especially now that one of society's darlings is slipping tales to the eager press. In this next thrilling installment of Anna Godbersen's bestselling Luxe series, Manhattan's most envied residents appear to have everything they desire: Wealth. Beauty. Happiness. But sometimes the most practiced smiles hide the most scandalous secrets. . . . This series is one of my all-time favorites. I love it! The characters, imagery (especially the dresses), plot, pacing and dialogue are all outstanding. 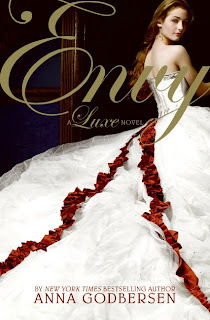 Once I started The Luxe, I was unstoppable and I can honestly say that I haven't enjoyed a series, especially a YA series, this much in a long time. Envy picks up about two months after Rumors ends. I feel so badly for Elizabeth; her situation is terrible. And Diana's love life (or lack thereof) is so sad too. I love how strong the women are---they had to be to make it in those times and in that back-stabbing society. I really enjoy the addition of Lina Broud's story. I am still in shock from the events at the end of Rumors, I just can't believe Anna Godbersen did that to us! It was downright Anita Shreve-like of her! I read Envy so fast, you would have thought I was cramming for a test. And of course, as soon as I finished I immediately picked up Splendor (Luxe #4). I don't know how the people who read these books as they were released waited months on end to find out how the story ends. I can barely work, talk to my husband, or live my life not knowing how the love stories will be wrapped up. I even considered taking a day off of work to finish the series (but I resisted)...it is just that good! I really can't think of one!